“Today, on the sidelines of the 38th ASEANAPOL conference, a meeting was held between the Minister of Internal Affairs of the Russian Federation, General of the Police of the Russian Federation Vladimir Kolokoltsev and the Police Commissioner of Brunei Jammi Al-Islam,” said the official representative of the MIA of Russia Irina Volk. The Russian Minister highly assessed the level of organization of the representative international event and thanked the Brunei partners for the warm welcome of the delegation of the Russian Ministry of Internal Affairs. Vladimir Kolokoltsev recalled that an important step in strengthening the contacts between the two agencies was the visit of the Brunei police delegation to Moscow a year ago. The Chief of the Ministry of Internal Affairs of Russia stressed that the problems of terrorism and other threats of the modern world can affect all states without exception, and the use of the Internet including electronic wallets, crowdfinding and crypto-currencies by extremist and terrorist organizations, is a particular danger. The parties expressed interest in exchanging information through the Interpol channels, which helps to bring terrorists and extremists to justice, as well as to suppress the facts of rendering financial assistance to them. 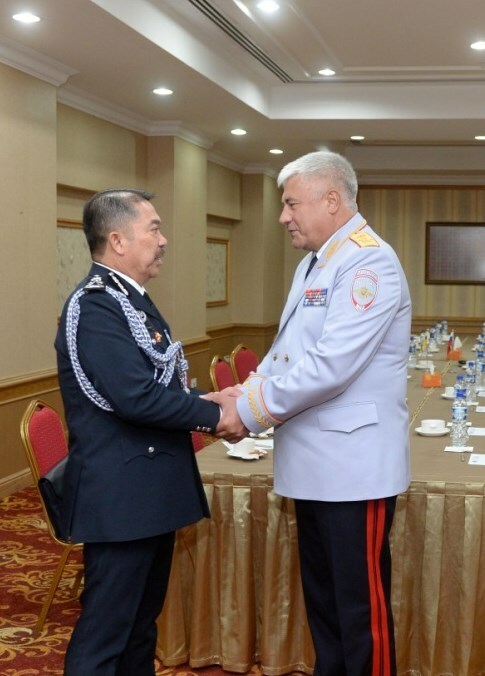 In addition, the parties discussed the possibility of training representatives of the Brunei royal police in educational organizations of the Ministry of Internal Affairs of Russia, as well as of participation in the seminar “Modern methods of countering terrorism and extremism” on the basis of the V. Ya. Kikot Moscow University of the Ministry of Internal Affairs of Russia scheduled for the second half of November. The Chief of the Russian agency invited his colleagues to visit the next International Exhibition of State Security Means “Interpolitex-2018”, which will be held on October 23-26 in Moscow.